This one is in perfect playing condition, freshly set up. The neck is dead-on true, frets in excellent condition, intonation perfect, and she is just a pleasure to play. In addition to the long scale and tone choke, I also really like the position of the "mudbucker" pickup in the body on the eb4 relative to the eb0. 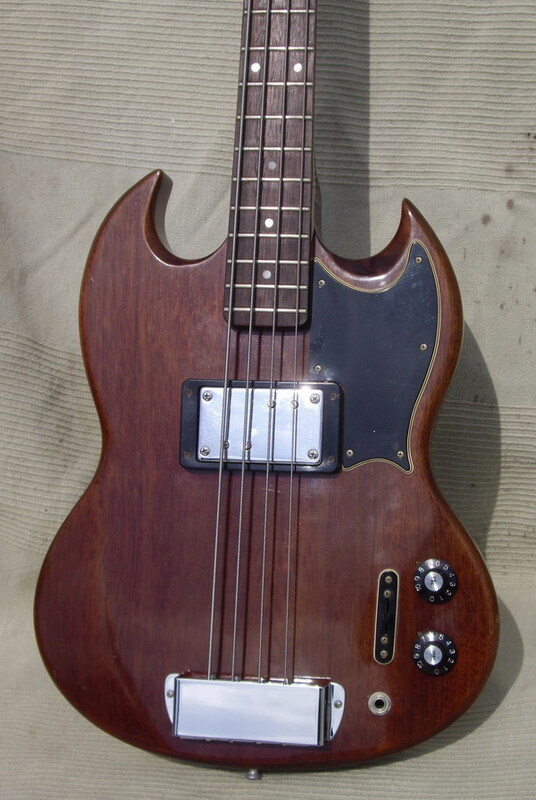 At first glance, the Gibson EB-4L, introduced in 1972, could have been mistaken for an EB-0L, which was a long-scale version of Gibson’s primary production bass. 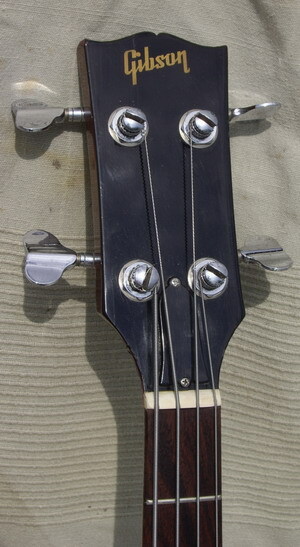 The single-pickup EB-0 was introduced in 1959 as a short-scale (301/2″) instrument. In 1961, its slab-type double-cutaway body (similar to late-’50s Les Paul Juniors and Specials) morphed into a pointed, SG-shaped instrument and was joined by a two-pickup variant, the EB-3. Incl. orig. 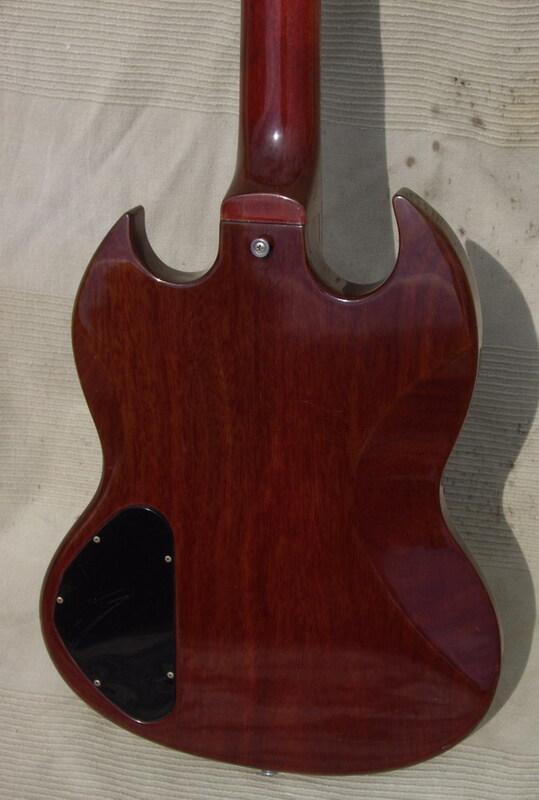 black Gibson case with violet lining. 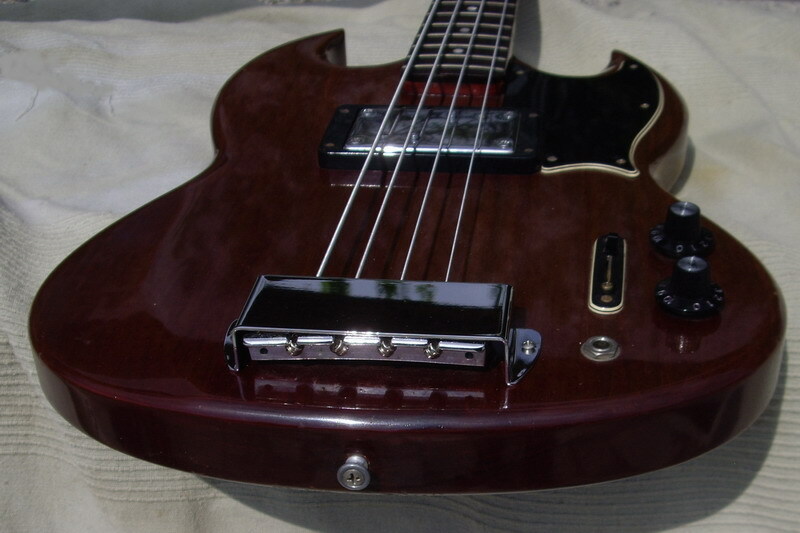 The EB-4L (often shortened to EB4, though it had no short scale counterpart) was first launched towards the end of 1972, and was very much an attempt to bring the EBO into the seventies, with its 'superhumbucking' pickup with tone selector switch, and long-scale (hence the 'L' in EB-4L) three-piece laminate maple neck. 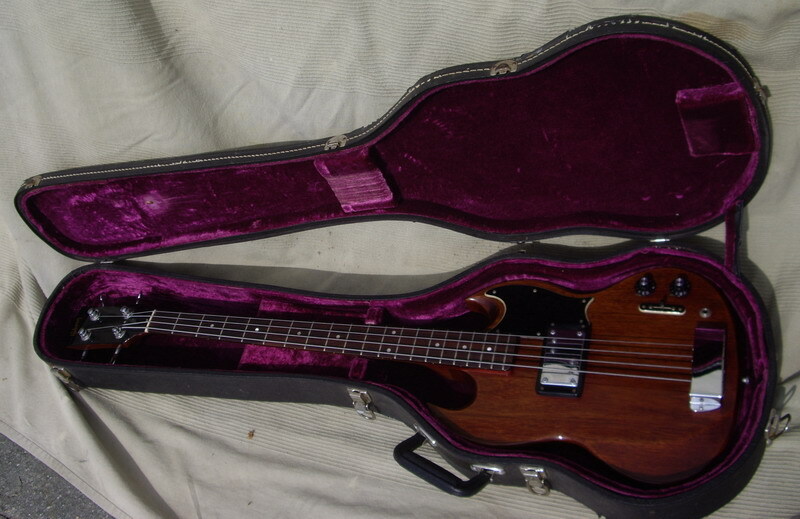 The vast majority of instruments were manufactured in 1973, but according to EB-4L shipping totals, small numbers were still being shipped as late as 1979, despite the last price list appearance being many years earlier in June 1973. It was first listed in the October 1972 price list at $420 (zone 1); roughly midway between the EB-0 ($385) and EB-3 ($450) basses. 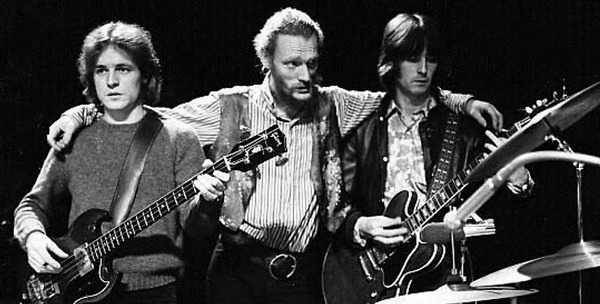 Then in November 1972, Gibson took the unusual step of including a full-colour flyer in Guitar Player magazine. 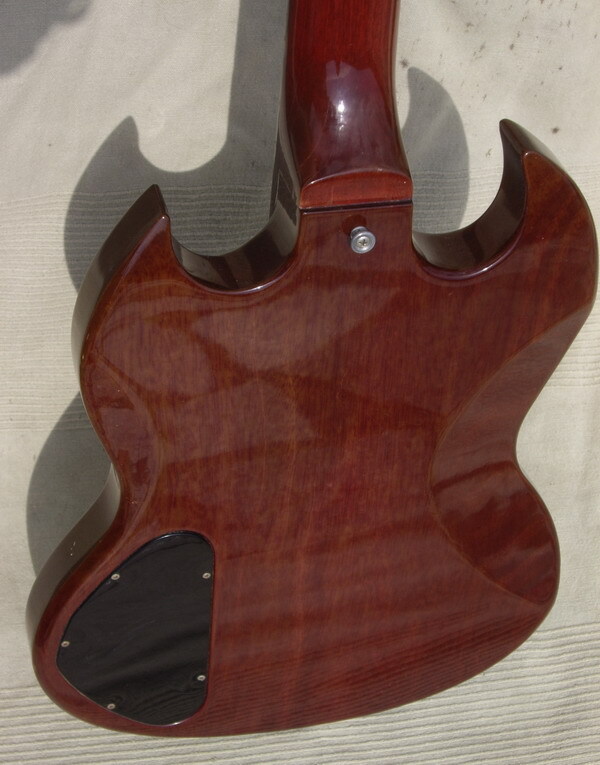 'The Bass Place' featured a number of SG-style basses old and new (EB-0, EB-3 and SB bass, but the EB-4L was the main feature, with a 2 page spread (compared to half a page for other models). SG basses had been selling very well over the preceding years, and Gibson must have been confident that they were going to sell a lot more. Orders for the EB-4L probably didn't live up to their hopes though. 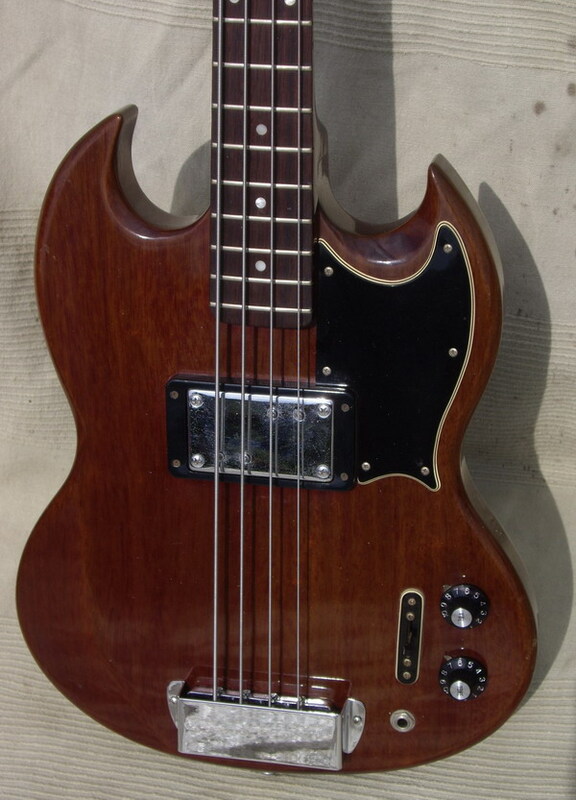 It sold reasonably well (992 basses in the first full year, 1973), but by the end of that year the L-9S Ripper was available and sales of all SG basses were very much in decline. 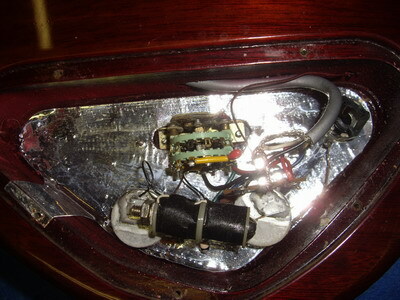 The EB4L super-humbucker actually contains 4 coils, one around each pole. Externally the difference can be seen in that the top two pole pieces are nearer the bridge, the bottom two nearer the neck. This design seperates the top two strings (coils) from the bottom two, and allows them to be heard in (i) series, (ii) series/parallel, (iii) series/parallel plus tone choke. The concept of this pickup is described in the 'Bass Place' flyer: This revolutionary new pickup design seperates the top two strings completely from the bottom two. You get more tonal response than ever, for a full, natural sound. And Gibson's new Super Humbucking Pickup design delivers more highs and "overtones" for a new sound thats packed with cutting power. In such a short production run, there were not too many design changes, although one difference between the earliest (1972 and early 1973 examples) and later ones was the choice of bridge. 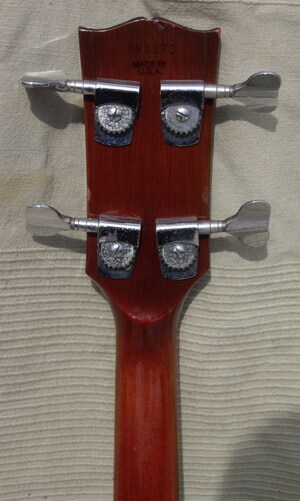 Initially a Gibson two-point, later a Gibson three-point. 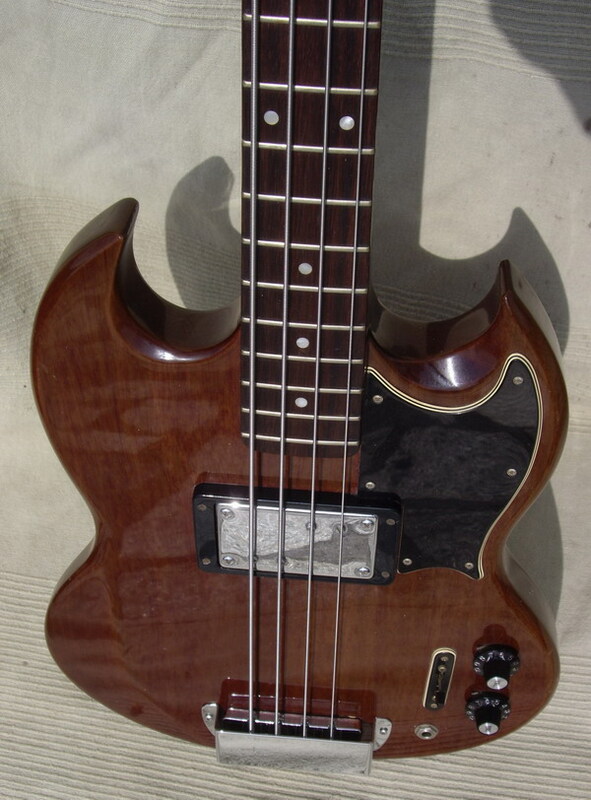 The EB-4L was available in two finishes: cherry and walnut, athough shipping figures also mention one ebony EB-4L made in 1975.